Yesterday was a glorious day to spend in the orchard, pruning the vines and trees in preparation for the upcoming growing season. With temperatures nearing the 70s, I wore a light jacket but could have hung it on the grape arbor instead. Last year the professor took charge of the grape vine pruning and did a spectacular job of tying up the vines. Grape production was good. The vines appear to have wintered well. Some of them are over 25 years old, have thick gnarly trunks and tendrils that attach securely to the arbor and to other vines. I pruned more severely than in the past, leaving only the main trunks and a few branching vines. 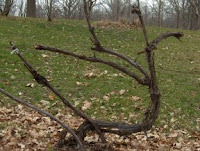 The Italians, Germans, French prune back to an ugly stump with a knobby top and some of ours have some semblance to those, and an opportunity to sprout new growth and produce as those European vines do. I'm tempted to describe the vines as calligraphy against the green backed orchard hill but they really look more like black chicken scratched lines clinging to the arbor with little white flag ties. It doesn't matter what they look like since how they produce is more important. Yet it does matter to me, the pruner, when I look at the tidy row and feel satisfaction in time well spent. Since this is a vinegar blog it's important to mention vinegar with each update: yesterday I washed the windows with diluted white distilled vinegar. I half filled a five gallon bucket with warm water, sloshed some vinegar into it and set about washing windows. I have to say I've become disillusioned with commercial spray window cleaners. The no-streak claims seem to be unsubstantiated. But I was amazed at the streak-free cleaning powers of plain old vinegar! Now to the blue cheese. My son-in-law, the professor, visited over the weekend. 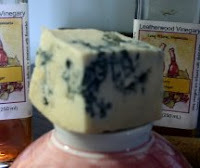 He brought an assortment of blue cheeses, fruit and port with which to celebrate spring. He had no fewer than 18 small china bowls on a large oval tray. In these he placed samples of the nine kinds of blue cheese he found in twin cities' markets along with black berries, Asian pears, apples, plums, grapes and strawberries. There were crackers, too, but to appreciate the more subtle variations in the flavors of the cheeses we just nibbled them in pure delectable nuggets. What a delightfully intimate way to try new flavors while celebrating the change of seasons! April tenth and there’s so much snow on the ground, and on my satellite dish, that I shoveled the walk instead of accessing the Internet and checking for mail. Each step of the entry walk had a foot of shape-holding marshmallow-like snow. I can just imagine the snow men that will arise from this spring-Friday-no-school-because-of-the-snow morning; unless other kids are like my twelve-year-old who is cuddled up on the couch, well into a good book. Since my Internet isn’t working, I’m blogging on my word program and will upload it when the snow slides off my dish. The moisture that this snow bestows will seep down and add to the supply of water deeper down. The spring melt has already dissipated the frost layer and allowed the puddles to disappear. It’s good for the soil but very hard on the trees. The two arbor vitae sentinels at the front of our house may not recover from the distortions of the snow load. After shoveling the snow off the front steps, with frequent rest periods to relax my arms’ muscle spasms, I shoveled a path to these trees that have been in their regal positions for twenty-five years. Striking the branches with my shovel, I succeeded in knocking much of the snow off. Though the branches sprang back somewhat, the distortions of the major branches are likely to remain but the one that broke will need to be trimmed away. While other pine trees suffer, too, from the way the heavy wet snow clings to their bracts and branches, the grape vines and fruit trees are feeling no ill effects. The moisture will be good for them.